Eating a plant based diet will help you overcome many illnesses, lose weight, and make you feel great. You’ll also be helping the environment due to eating fewer water greedy animal products, and use less packaging due to eating fewer processed foods. Eating this way can be easy too. But, there is a lot of confusion due to the different types of plant based diets, and different “gurus” who proclaim to know what’s best. You’ll need to decide what type of plant based diet works best for you. This diet consists of eating only whole food raw plant based food consisting of 80 percent carbohydrate, 10 percent protein and 10 percent fat. Most people who are on the 80/10/10 raw food diet do not eat processed oils and added processed sugars. A meal might consist of 6 bananas, 7 ripe peaches or a large salad that looks like it’s for a family consisting of one to two pounds of greens, fruit, nuts and seeds. This diet made popular by Dr. McDougal, consists of making starches like potatoes, sprouted grains and rice your main food group. Root veggies eaten judiciously with at least 1 to 2 pounds of greens each day with no added fat, salts and very little sugar is the diet that he recommends for weight loss and cardiovascular health. He is also a huge proponent of exercising each day and getting plenty of sunshine. This diet consists of eating more greens, and less starch or fruit based carbs. It’s sort of an “Atkins” like diet for vegans. You will eat a lot of leafy greens, flowering veggies like cauliflower and broccoli, plus mushrooms. This diet is low in sugar and added salt. You’ll be eating fruit like berries instead of bananas, and high fiber asparagus over high carbohydrate root veggies like carrots. On this diet you can eat coconut oil, avocado, nuts and seeds. This diet is based on the standard diet recommendations to eat 30 percent protein 30 percent fat and 40 percent high fiber carbohydrate in your diet. You can easily accomplish this by simply eating whole food plant based food every day in the right caloric amounts for your needs without worrying about whether you are eating added oils. However, you may need to be sure to add protein to each meal in the form of tofu, beans, or other meat replacements. It can be hard to lose weight on this diet. The best way to choose which diet you will follow is to start with your doctor. Get some blood tests run to find out where you stand in terms of your cholesterol level and overall health. Then choose the diet that is best for you and addresses your health issues. For people who are very ill, eating a diet very low in overt fat and protein of no more than 10 percent has been shown to be highly beneficial according to The China Study and many other studies done over the years. 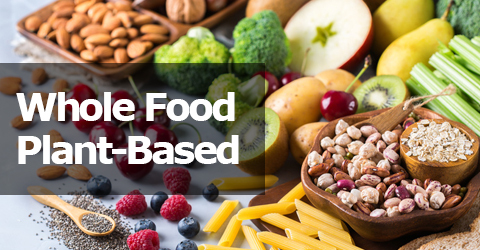 A plant-based diet is based on foods derived from plants, including vegetables, wholegrains, legumes, nuts, seeds and fruits, with few or no animal products. People choose a plant-based diet for a variety of reasons including concern about the treatment of animals, health reasons, environmental concerns or because of taste and social pressure. Plant-based diets are becoming more popular and if they are well-planned, can support healthy living at every age and life-stage. Lacto-ovo vegetarians – eat dairy foods and eggs but not meat, poultry or seafood. Ovo-vegetarians – include eggs but avoid all other animal foods, including dairy. Lacto-vegetarians – eat dairy foods but exclude eggs, meat, poultry and seafood. Vegans – don’t eat any animal products at all, including honey, dairy and eggs. Many shop bought ready-made products may contain animal ingredients so the labels of all manufactured products do need to be read carefully. Pescetarians – eat fish and/or shellfish. Diets centred on a wide variety of plant foods offer affordable, tasty and nutritious options. Plant-based diets which are rich in beans, nuts, seeds, fruit and vegetables, wholegrains such as oats, rice, and cereal based foods such as breads, and pasta can provide all the nutrients needed for good health. This includes essential fats, protein, vitamins, minerals and plenty of fibre too. Well balanced plant-based diets, that are also low in saturated fat, can help you manage your weight and may reduce your risk of type 2 diabetes, cardiovascular disease and some cancers. However, as with any diet, plant-based nutrition needs to be planned. Most nutrients are abundantly available in plant-based diets, but if you are avoiding all or minimising your consumption of animal-derived foods there are a few nutrients that you need to pay attention to. Calcium is essential for bone health, along with weightbearing exercise and a healthy diet. An adult requires approximately 700mg per day. Dairy foods are rich in calcium but if you are not eating these make sure you obtain calcium from other sources like fortified plantbased dairy alternatives, dried fruit e.g. figs, nuts such as almonds, leafy green vegetables, red kidney beans, sesame seeds, tahini and tofu to lower your risk of bone fractures. These fats have been shown to be important for health and are commonly found in oily fish. However, if you are not eating fish, plant sources of omega 3 include walnuts, flax (linseed), hemp seeds, chia seeds and soya beans. Oils such as hemp, rapeseed and flaxseed oil provide essential omega 3 fats and are preferable to corn/sunflower oils. Vitamin D is needed to keep bones, teeth and muscles healthy and is made in our bodies when our skin is exposed to appropriate sunlight. In the UK this is usually between April and September. During the winter months, we need to get vitamin D from our diet because the sun isn’t strong enough for the body to make it. Plant-based sources of vitamin D include sun-exposed mushrooms and fortified foods such as vegetable spreads, breakfast cereals and plantbased dairy alternatives. Since it’s difficult to get enough vitamin D from food alone, everyone should consider taking a daily supplement of 10mcg/ day during the autumn and winter months. Some vitamin D supplements are not suitable for vegans. Vitamin D2 and lichen-derived vitamin D3 are suitable. The major sources of iodine in our diet are dairy products and fish. The iodine content of plant foods depends on the iodine content of the soil which is variable. Foods grown closer to the ocean tend to be higher in iodine. Where soils are iodine deficient, iodised salt and seaweed provide iodine which is needed in moderation. As the iodine content of seaweed is variable, and sometimes too high, guidance is not to consume sea vegetables more than once a week. An excess of iodine is also unhealthy so if you are taking a supplement, discuss this with your dietitian. We need vitamin B12 for many reasons. Too little can result in fatigue, anaemia and nerve damage and increase homocysteine levels leading to cardiovascular disease. Most people get vitamin B12 by eating animal products. If you are eliminating all animal derived foods, the only reliable sources of vitamin B12 are fortified foods and supplements. Suitable B12-fortified foods include some breakfast cereals, yeast extracts, soya yoghurts and non-dairy milks. To make sure you get enough vitamin B12, either eat fortified foods at least twice a day, aiming for 3mcg of vitamin B12 a day, or take a supplement, 10mcg daily or at least 2000mcg weekly. If you are worried whether you are obtaining sufficient vitamin B12, a dietitian can calculate your intake from food/supplements or a doctor can check your blood homocysteine levels. Plant sources of iron include dried fruits, wholegrains, nuts, green leafy vegetables, seeds and pulses. The form of iron in plant foods is absorbed far less efficiently compared to iron from animal derived sources such as meat and eggs. Eat plenty of fruits and vegetables rich in vitamin C to help the iron to be absorbed e.g. citrus fruits, strawberries, green leafy vegetables and peppers. Phytates found in plant foods such as wholegrains and beans reduce zinc absorption, so it’s important to eat good sources of zinc-containing foods. Eat fermented soya such as tempeh and miso; beans (soak dried beans then rinse before cooking to increase zinc absorption); wholegrains; nuts; seeds and some fortified breakfast cereals. Plant sources of this mineral include grains, seeds and nuts. Just two brazil nuts daily will provide you with your daily requirement of selenium. Plant-based sources of protein include lentils, beans, chickpeas, seeds, nuts and nut butters (e.g. peanut butter), and tofu. Eggs, and dairy are also good sources if you are eating these. Meat substitutes like vegetarian burgers, soya sausages, and other meat alternatives can be useful for those adapting to a plant-based diet and can provide a source of protein. However, as with any processed foods, these can often be high in salt and fat so should be used in moderation. These products may contain animal ingredients such as eggs, milk derivatives and honey so careful label reading is necessary if you wish to follow a vegan diet. In the UK, it is estimated that well-planned completely plant-based, or vegan, diets need just one third of the fertile land, fresh water and energy of the typical British ‘meat-and-dairy’ based diet. With meat and dairy being the leading contributor to greenhouse (GHG) emissions, reducing animal based foods and choosing a wide range of plant foods can be beneficial to the planet and our health. Well-planned plant-based diets can support healthy living at every age and life-stage. Include a wide variety of healthy whole foods to ensure your diet is balanced and sustainable.